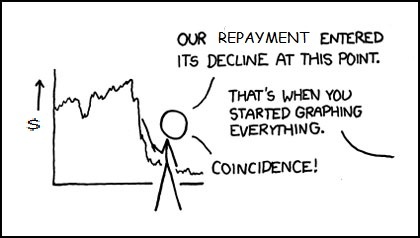 Heisenberg Uncertainty Principle + Loan repayment? How do we figure out which clients have the potential to borrow and successfully repay small loans? We start with clients who believe that they need our services. Our current selection criteria are based on a basket of qualifiers that we have adapted from programs of successful MFI’s. I believe that our current loan criteria of Gender, Location and the Approval of Honduran Loan Officer are effective at screening our clients, based on the current scale of our programs. I think offering our clients the $25 buyout option is worthwhile, if we expect at least a 4:1 repayment. Mandatory classes for borrowers, smacks a little patronizing to me, but if there are positive results from other MFI’s, I can reconcile that. I would like to see our clients choose from a selection of classes, with topics covering savings, financial education, etc. This way we get some additional information about the demands of our clients. I would like to see the inclusion of a financial information diary in the loan package given to potential borrowers. I’m convinced that one of the best contributions to the literature that we might be able to collate and present is the household spending of our clients. I don’t think this information is available to most gringo-centric MFI’s in Honduras or around the world. We pride ourselves on the relationships that we build with our clients, and we must be able to use these relationships to help develop innovative services for our clients, as well as advance the scholarly research in the microfinance field. If we want to grow and increase our repayment rate, I firmly believe that we must evaluate the feasibility of loaning to men. I don’t think that we should begin loaning to men during this trip, but I believe that we owe it to ourselves and our clients to investigate the demand which already exists in the communities we are working in. There have been multiple cases of women seeking loans, and then turning over the principal sum to a male family member or another male in the community. This gives us no recourse to hold him accountable, and can negatively affect the way she interacts with La Ceiba. One of the fundamental issues raised in the Illich article is that our interactions within a community will have repercussions that we cannot anticipate. Empowering women seems like a great idea, but is it just another way to say destabilizing household norms, or even actively antagonizing the male population of Villa Soleada? We owe it to our female clients to try and understand this relationship, and investigate this issue while on the ground this winter. We have discussed the idea of a diary for business loans, but hadn’t in terms of personal loans. From the beginning, we have decided that asking people to tell us what they are spending the money on is an invasion of privacy to some degree. Anyways, how do we know they are not just writing down what they want us to hear? If they wrote down that they used the loan money to buy hand creme, a radio, etc. is it our business to punish this “extravagance?” should it factor into whether we give them a loan? How can we trust the information provided? Just some food for thought. Thanks again, any thoughts welcome!